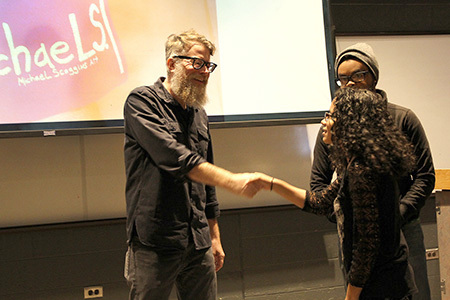 Michael Scoggins (center, with beard) with art students following his talk. Scoggins meets students following his presentation. Mulling over works by Michael Scoggins in the MCCC Gallery. 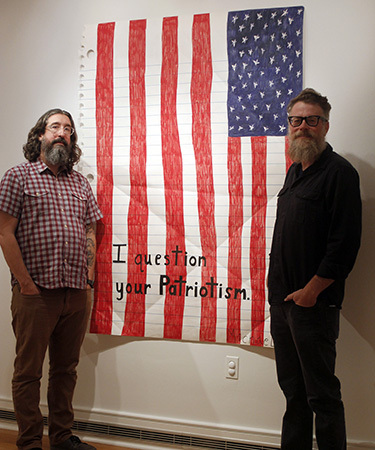 Michael Scoggins, right, with Gallery Director Lucas Kelly. 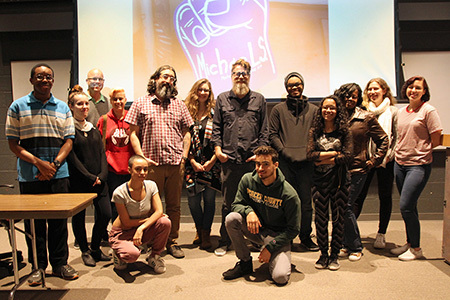 West Windsor, N.J. – The internationally recognized artist Michael Scoggins shared some sage advice from his career as a professional artist during a visit to Mercer County Community College’s (MCCC’s) West Windsor Campus Oct. 18. His show, “#RealNews,” is featured at the Gallery at Mercer through Nov. 30. The exhibit was curated by MCCC Professor of Fine Arts Lucas Kelly, Director of the Gallery. Scoggins says he has been drawn more and more to colleges and universities in the past few years. "I like talking to students. I am happy to help them make their way in this weird profession,” he said. During a lunchtime talk with art students, faculty and staff, Scoggins described his journey to his current signature work, in which he uses large rolls of paper to create oversized notebook pages of musings and drawings – sometimes funny, but almost always unsettling. Political and social commentary is often part of the work, but is softened by Scoggins’ use of a persona, Michael S., who scrawls his name at the bottom of the pages. 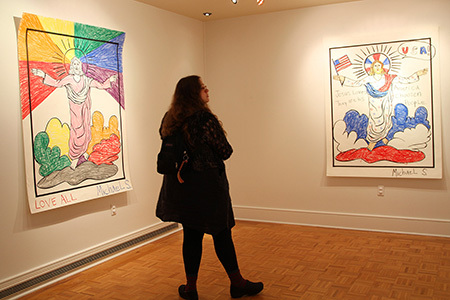 Scoggins said his work is an intersection between his art and his interest in politics and history fostered by his early years in Fredericksburg, Va., which is rich in Civil War history. After high school, Scoggins attended a community college for two years before earning bachelor’s degrees in Studio Art and Political Science from Mary Washington College. Using traditional painting techqniques right up to his graduate studies at Savannah College of Art and Design, Scoggins came to realize he had ideas he wanted to express that required a less conventional approach. Already relying on the use of notebooks to jot down his thoughts and make sketches, he arrived at the idea of giving his drawings – and the notebooks themselves – more legitimacy. A prolific artist with studios in Brooklyn and Upstate New York, Scoggins explained to the students that it’s not enough to produce a lot of work. “It takes persistence and getting your work out there. You have to use social media, post works in progress, and join in competitions,” he said, but warned them away from “Pay to Play" competitions. Scoggins notes that after grad school, he had several residencies that helped him network and make the transition to his pursuit of art professionally. A big break came when a gallery in Atlanta that he had approached suddenly called. “Another artist canceled at the last minute. They asked me to take his place. I piled everything into my car and headed to Atlanta. Always have two shows of work in your studio ready to go,” he advised. Scoggins says it’s important to research galleries before sending any kind of packages. “They should be the right galleries for your work,” he explained, but advised against sending unsolicited packages. And, while he encouraged students to attend gallery opening and art shows as career-building opportunities, he noted, “Never show up to an opening with your portfolio." Scoggins' work has gained international recognition and gallery representation in Atlanta, Miami, New York, Detroit, San Francisco and Vienna. His works have been added to collections including the Hammer Museum in Los Angeles and the Museum of Modern Art in New York. He has had more than 20 solo exhibits and been featured in multiple curated group exhibitions. He has been written about in a wide variety of publications.